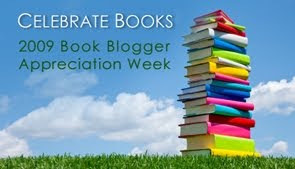 In honour of Book Blogger Appreciation Week I am giving away a brand new copy of Joshlyn Jackson's The Girl Who Stopped Swimming, which I reviewed in the post above. -For one entry - leave a comment, telling me the name of your favourite ghost in literature, film or on television. -For two entries - answer the question above and also become a new follower to my blog. -For three entries - answer the question above and already be one of my followers. That is it - an easy peasy competition that is open worldwide. Closing date for the competition is midnight GMT Thursday 24th September. I don't really have a favourite ghost. In fact I don't think I can even think of one. And I already subscribe to your blog...does that count? My favorite ghost is definitely the late, great Patrick Swayze in 'Ghost'. Hi Vivienne, don't enter me, Sweetie, I already read the book. I just want to say I couldn't put it down when I read it. Such nice giveaway! Good luck to all the entrants! Recently I read Ghosts by Paul Auster and think that was good. And no, dont enter me. I own this book. My favourite ghost in a film would have to be the Liam Neeson ghost in High Spirits *g* Phwoooargh! Or the Alan Rickman one in Truly Madly Deeply. Double Phwooooaaaar! My favourite ghost in a novel would probably be... Christine. Does she count? My favourite ghost in a film would be the poltergeists in Poltergeist (is that too obvious? :P) - so scary! - or Patrick Swayze in Ghost (another obvious answer hehe). I'd love to read this one Viv ~ please count me in. Everyone else has such good answers. I would have never thought of Patrick Swayze in Ghost. Or even Casper. No, when I thought about the question originally, I thought of this really old television programme called 'Ghost Writer' where a bunch of kids solved mysteries with the help of this ghost.. Anyway. Your question is so interesting considering the recent death of Patreick Swayze. He is a favorite ghost of mine but I also got a kick out of Beetlejuice! The Girl Who Stopped Swimming is on my TBR list. This is a wonderful giveaway! Thank you! I'm and have been a follower! Thank you for the easy peasy contest. No need to enter me, my TBR is taking over my life...lol. Maybe I'm feeling a little nostalgic after what happened to Patrick Swayze but I am voting for him in 'Ghost'. Also the movie Ring? Scary. I'm already a follower (google reader).